Why if one toner runs out does my Konica Minolta C20 printer stop working, even if set on "black only". Why can't it run on black toner only? It's very inconvenient if one colour runs out. Thanks, Tom. Unfortunately, most colour laser printers will require that all four colour cartridges are installed with at least some remaining toner in order to print in any colour. For further information on your Bizhub C20 printer settings please consult your printer manual or contact Konica Minolta directly. 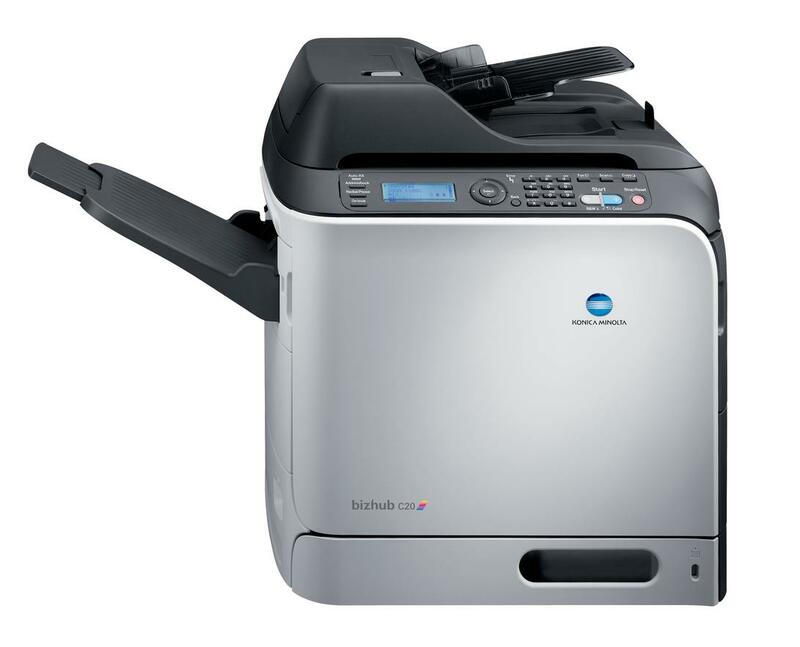 The Konica Minolta Bizhub C20 multi-function colour laser printer is a whirlwind of productivity. With speeds of up to 25 pages per minute, the C20 prints, copies, scans and faxes with excellent quality and a high monthly volume workload. Each Konica Minolta C20 toner yields 8,000 pages and includes separate toner cartridges for each colour. This printer is perfect for a busy work environment and can easily handle the print jobs of your whole office floor without breaking a sweat. A lot is packed into the design of the Konica Minolta Bizhub C20. Many manufacturers have a difficult time fitting all four colour toner cartridges into the small space of an office printer, but this printer is laid out with precision in such a way that is easy to change the Konica Minolta C20 toner cartridges and access the major components for maintenance while keeping the footprint small so that the printer doesn't get in the way of everyday office tasks. Measuring 53.9 cm x 59 cm x 57.8 cm, the Bizhub C20 forms a compact cube that will fit any environment. Minolta has even taken made sure that the operating volume of the Bizhub C20 is low so that it does not disturb quiet office environments while making the printer energy efficient. The Bizhub C20 is loaded with benefits including a full suite of office essentials that are easy to use without consulting a thick manual. Integrating with multiple operating systems and sporting an intuitive onboard digital menu, this office workhorse provides a cost-effective solution for small and mid-size office teams. The Bizhub C20 includes a built-in 50-sheet Reversing Automatic Document Feeder (RADF) to make multi-page copy jobs easy. Scan directly to email or fax from the flatbed scanner or RADF. Other beneficial features include a USB flash drive port for direct printing from thumb drives and external hard drives. The Konica Minolta C20 toner cartridges are available on Cartridge Save and have a long life of 8,000 pages each. Churning out 25 pages per minute in both black and colour makes the Bizhub C20 a real force to be reckoned in the business world. There are few disadvantages to the C20. In order to equip the Bizhub C20 printer with networking, the C20X must be purchased at a slightly higher price, however this is well worth it for the full-office networking capability. To achieve the advertised 850 sheet paper tray capacity, an extra 500 sheet lower feeder unit must be purchased as an optional accessory. Larger businesses may also need to increase the onboard memory from 512MB to 1,024MB for additional productivity. In order to take advantage of the secured print, print and hold, proof then print, and stored job functions, an optional 40 GB internal hard drive must be added and cannot be installed at the same time as a compact flash card.